June 2014, Krakow – The twenty-first of June is the longest day of the year and the shortest night; the summer solstice. Every year on the same date many Polish cities hold the Wianki Music Festival—chief among them Krakow. 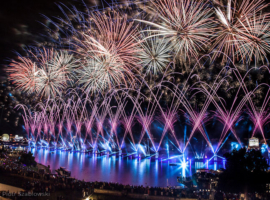 With tons of fireworks, a wide variety of musical offerings and an impressive array of FALCON searchlights, the banks of the Vistula near the Wawel hill this year were bathed in light and sound—a summer spectacle of a particularly spectacular variety! 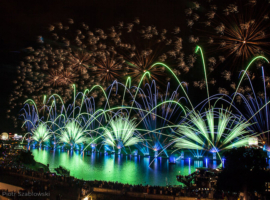 Lighting designer Pawel “Spider” Pajak (Fish Eye) set the powerful coloured beams of FALCON searchlights dancing in the night sky as fireworks detonated all around them in a wide variety of colours and shapes. 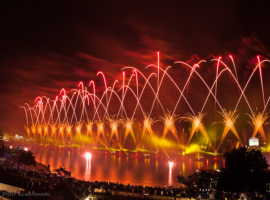 Krakow was aglow and spectators were enthralled. 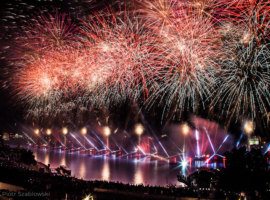 A&O Technology’s involvement in the event through the client TSE took the form of sixteen FALCON BEAM colour 3000W and thirty of the innovative xenon/LED hybrid FALCON CMY LED VIDEO luminaires supported by trained technicians. One challenge the event posed was the great distance over which the searchlight network extended: the FALCON BEAM colour 3000W searchlights were stationed at 30-metre intervals along the river bank over a length of just under 500 metres. There, too, the batteries of fireworks for the great display were installed. The FALCON CMY LED VIDEO luminaires were used as xenon/LED hybrid searchlights arranged in six groups of five on 1.5-metre platforms. It was their role to provide the crowning moment of the festival with a 15-minute, timecode-controlled show. The searchlights were controlled from the opposite bank of the river via wireless DMX. Two technicians from A&O Technology had been despatched to set up the FALCON searchlights for the big day and establish the network.